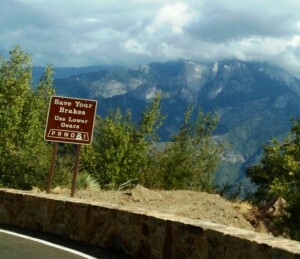 We left Fresno, California mid-morning of September 26th and headed toward Kings Canyon National Forest. A note of explanation here: As one of the 12 National Park stops on the original 1920 Park-to-Park Tour the participants visited what was then called “General Grant National Park”. Today, as best as I can determine comparing the 1920 and current day maps, much of General Grant Park has been assimilated into both Kings Canyon National Forest and Sequoia National Park (the park boundaries look much like those of some of the gerrymandered electoral districts in North Carolina, with “fingers” jutting out into surrounding areas. Can’t imagine why the deer vote is so important to them that they broke things up the way they did. Because of these irregular boundaries, General Grant Grove (where the “Grant Sequoia” resides) is technically in a “thumb” of Sequoia National Park; and Hume Lake, which was in 1929 the furthest reach into what was then General Grant National Park and is now in Giant Sequoia National Monument district of Sequoia National Forest (or perhaps Sequoia National Forest district of Giant Sequoia National Monument) – oh well, just as long as someone keeps folks from turning the trees into toothpicks. OK, back to the Trek. So, we were merrily making our was east from Fresno to Kings Canyon National Forest on a nicely improved and well maintained route 180. Then, I recalled that the original 1920 tour may have taken a route through the town of Dunlap which on the map appeared to be just a small diversion from the straight shot to the Forest that we were on. So, we hung a right toward Dunlap and soon gained an appreciation of the contorted route the rural roads in this region take as they wind themselves through this semi-mountainous rural region. The surface condition of these extremely winding (both horizontally & vertically) roads was reasonable – they just lacked such refinements such as shoulders, curve markers and guard rails in critical locations. The other thing that we found humorous, if one dare break one’s concentration to think about anything else but the car that one might meet around the next blind curve, was the presence of a dotted yellow line down the center of the road for most of its length. Having just turned off of route 180 where there were double yellow no passing lines in areas where one could have easily pass safely, we found it perplexing that they would have passing indicators on this road where the sight distance seldom expended beyond ones front bumper (slight exaggeration). Fortunately, we were practically the only ones traveling these roads (the others either, a) knew better than to use these roads or b) were eliminated through natural selection; having gone over the edge or experienced a sudden stop against an oncoming vehicle). While stopped at an intersection to confirm that we were generally headed in the right direction, a local gentleman politely asked us “what are you doing here?” explaining that route 180 was a much more convenient path. When we explained our attempt at reenacting a prior route, he said the roads would eventually improve as we neared the Forest. Sure enough, after a half hour or so, we were on a 2 lane road that felt like a super highway – no-passing lines and all. We entered the “thumb” of Sequoia National Park from the west and drove directly to the General Grant Grove area of the Park. There we had our first first-had exposure to giant sequoias. They were really large! Sequoias are generally shorter than their redwood cousins, but existing specimens may be twice the diameter and weight of the redwoods and up to 3,200 years in age (wonder who counted all those growth rings?). 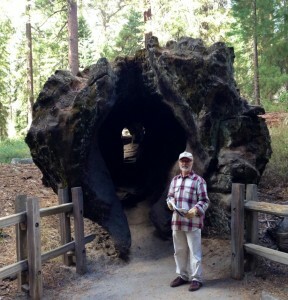 The prince of the sequoias in the General Grant Grove is the General Grant Tree (reminds me of the old Groucho Marx the quiz question “Whose buried in Grant’s Tomb?”). 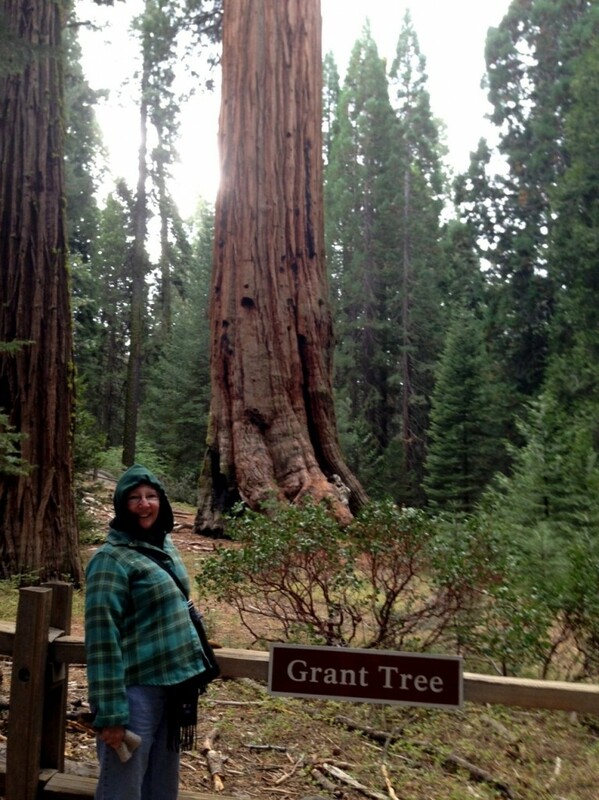 Anyway, the General Grant tree is the largest standing tree in the General Grant Grove region of Sequoia National Park. While in the General Grant Grove we experienced a situation that was duplicated several times during our Trek of the National Parks. At some point when we were either leaving or returning to our Jeep, a tour bus transporting a group of Europeans (usually French or German) would pull in to the parking lot; their iPhones immediately aimed at surroundings. However, once they noticed the Jeep, their attention would be redirected at the car; their iPhones, like miniature radar dishes homing in on the target. We would have fun trying to communicate with each other regarding the age and lineage of the Jeep. Many of the older folks were familiar with the name Willys Jeep from World War II and understood when I pointed out the bronze “Jeep” medallion in front of the diver’s-side door. We enjoyed “talking” to them. At the time of the 1920 Park-to-Park Tour the road into what was then General Grant National Park only extended as far as Hume Lake. 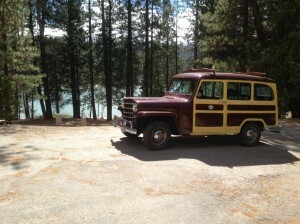 Jean and I decided to make the innocent looking trek to Hume Lake. Well, it was worth the effort to be able to say that we had been there; however, the final 3-mile curvy stretch down (the operative word being “down”) to the lake and campground did not disappoint. After some photo taking to document our achievement we clawed ourselves out of that depression and back-tracked our way to the Kings Canyon Visitors Center for some lunch before heading south to the adjacent (in some placed intertwined) Sequoia National Park. We enjoyed a driving tour through the giant sequoias as we headed south (on average) on the extremely (you guessed it) winding Generals Highway. In places the switchbacks were so tight that we could almost see our own taillights. 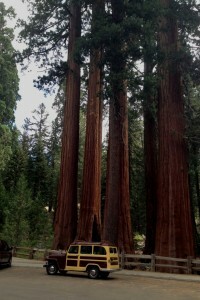 With ample examples of giant redwoods and sequoia visible from the car, and fearing any break in concentration as we negotiated the path south, we elected to be satisfied with viewing the trees from Jeep. We exited Sequoia National Park at the southern Ash Mountain entrance and headed on to our evenings lodgings in Bakersfield, California.